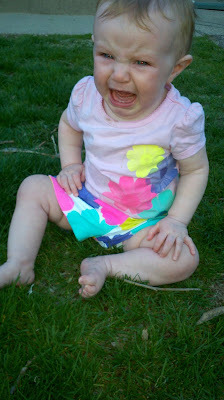 First time in the grass. She wasn't a fan. As a daycare provider, I'm used to parents handing over their precious babies to me every day. I'm used to the "trial and error" period, which is the (usually) short period when I first take a baby and the child and I get to know each other. I learn their numerous cries, what they like, how they like to be fed, held, etc. During this time the baby is also getting to know me. I'm lucky because this period is never long and has been smooth sailing. In the long run, I get to watch this perfect little baby grow and share in the joys of raising a child. I get to see many firsts: first smile, first laugh, first belly laugh, first attempt to roll over, the first roll over, first time they grab a toy away, first step, first word. But that's the problem: I see the FIRST. As a daycare provider, it's sweet victory. I've (likely) watched this baby attempt to roll or grab for an older kid's toy for days or weeks. From a parent standpoint, it's devastating. I know what it's like to experience firsts as a parent and it's exhilarating. It's special. I got to see all my kid's firsts and I can confidently say I was more proud and excited about each accomplishment than they were. Hell, half of the time they weren't even aware of what they had done! Now, I imagine if I had missed them and instead, someone else got to view them. How would I handle that as a parent? And how do I handle that as a daycare provider? From a parent standpoint I wouldn't be exactly thrilled that I missed a first. It's a parenting right of passage to witness firsts. As a daycare provider, I down play it, with the parents at least. When I see a first during the day, we celebrate it. There's clapping, cheering, the baby/child is showered with hugs and kisses because that's what I would do with my child. But I don't want to take that away from the parent(s). Usually I make a note on the daily sheet about what the baby did and mention it to the parent(s) at pick up. I don't want to keep it from them-it's important that the child's parent(s) know that their child is hitting milestones/climbing things/eating certain foods/etc. I attempt to hide my excitement of witnessing whatever and casually tell the parent(s) what happened. I do this knowing that if they've done such and such thing at my house, it's sure to come at home too. So, as a daycare provider, I'm curious: would you want to know if someone else saw your child's first? How do you handle it if you see another person's child's first?